The story was tailor made for television. Even President Obama thought so. 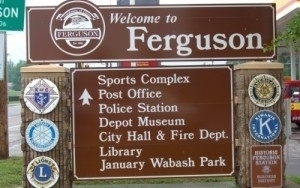 “There is inevitably going to be some negative reaction,” the President said in his televised remarks following the announcement Monday evening that Ferguson, Mo. police officer Darren Wilson would not be indicted in the shooting death of Michael Brown. “And it will make for good TV,” Obama acknowledged, referring apparently (if not awkwardly) to the images of unrest that were already coming out of Ferguson. As it turned out, the images were all that -- and they were applied with dramatic effect, particularly when various networks positioned video of the growing unrest in Ferguson in one half of the screen alongside the President speaking in the other half. Talk about being tailor-made for television: Here was the President of the United States issuing a plea for calm, while at the very same time, the scene in Ferguson was anything but. A similar juxtaposition was on view earlier too, when St. Louis County Prosecutor Robert McCulloch delivered his dry recitation of the facts and issues in the case, and in the process, buried the news of this non-indictment so deeply in his remarks that you could be forgiven for wondering if you had even heard it. I wondered if this was a deliberate strategy on his part -- as if the prosecutor believed he could lull his audience into such a stupor that the decision not to indict would pass unnoticed. On the split-screen, it did seem as if the crowd in Ferguson was slow to realize what had happened. But this initial period of calm (or possibly bewilderment) was short-lived. Within a short time, various participants in the assemblage outside Ferguson police headquarters were on the move. Before long, a police car was vandalized and the scene became violent. A police public-address system began issuing orders to clear the streets, teargas canisters were launched and events deteriorated from there. If you stayed up late, you could watch the whole thing unfold. If you didn’t stay up, then you woke up to the news that half the buildings in Ferguson seemed to have been burned down during the night. Among the most compelling images of overnight destruction that you could see on the morning news shows: A row of cars burning in a parking lot. You see something like that and you ask yourself: How did this happen? Who did it? What purpose did this serve? Some people will ask -- as they do whenever this kind of unrest is seen unfolding in real-time on TV -- if the participants in these riots become emboldened by the presence of the media and their TV cameras. Others ask if the media makes too much of these events and in so doing, fan the flames. In Ferguson, however, the flames were already well-fanned, and they would have been fanned whether the news media were there or not. As you may have noticed if you watched the coverage, access to cameras was not exactly restricted to news organizations. In Ferguson Monday night, just about everybody within camera range seemed to be holding cameras of their own. It’s never clear what these people intend to do with all of this video, however, other than plan to post it on YouTube and then, more often than not, never get around to it. As for the huge media presence in Ferguson, you can hardly expect the news media to stay away from such a situation out of fear that someone might accuse them later of fanning the flames and making things worse. Criticizing the news media for covering this story is tantamount to attacking the messenger. Or throwing rocks at them. 2 comments about "'Good TV'? Not Exactly, But Ferguson Riots Were Riveting". Linda Moskal from WNPV Radio, November 25, 2014 at 3:37 p.m. I don't mind the news media covering a news story but localizing it is getting out of hand. How dare Mayor Nutter of Philadelphia say that St. Louis County Prosecutor didn't follow the evidence! He wasn't there. He didn't see the evidence provided to the Grand Jury. And why, exactly did any reporter even ask him? Paula Lynn from Who Else Unlimited, November 25, 2014 at 7:07 p.m. Yes, the news media are salivating. However, what I see is that so many seasoned, professional journalists have been turned out with untrained young whippersnappers who are much cheaper and inexperienced who do not do their homework, rather depending upon unsubstantiated twits, etc., in order to get their 2 cents in, too.